Last week a local man, Larry Stauffer, brought in the above fossil for identification and then kindly donated it to the department. It is part of the root system of Lepidodendron, the “scale tree” of the Carboniferous Period. What is especially cool about it is that the rootlets, thin ribbon-like perpendicular extensions, are still attached. Usually they were lost quickly when the root was dislodged from its bed. 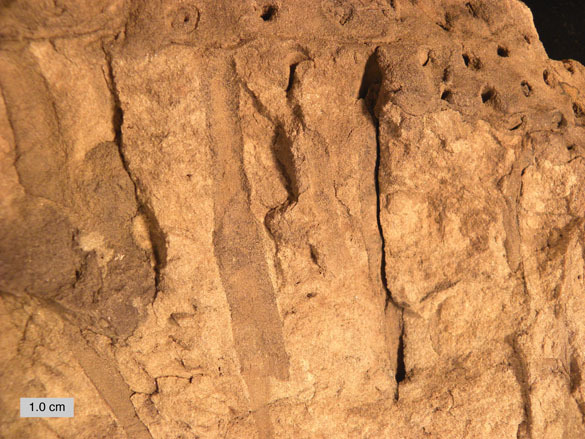 The well-preserved rootlets show that this bit of root is still in its original soil. 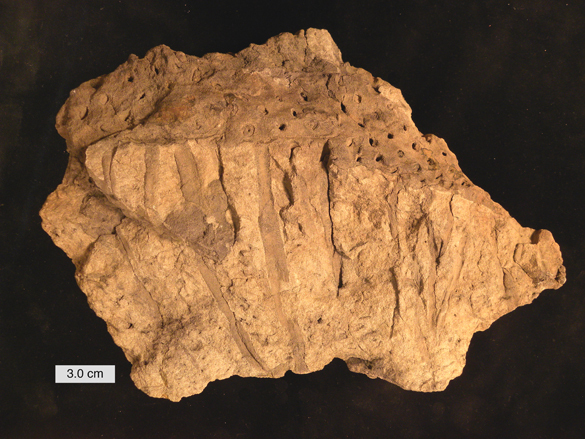 Such a fossil soil is called a paleosol. These features are important in the rock record because they show ancient climate conditions, weathering profiles and sedimentation rates. Carboniferous paleosols like this are called seat earth. The roots of Lepidodendron were given a separate generic name in 1822 by the French naturalist Alexandre Brongniart (1770-1847). He called them Stigmaria because of the regularly-spaced holes called stigmata. (You may know “stigmata” from an entirely different context!) The name was superseded by Lepidodendron once it was figured out how the roots, trunk, and leaves were connected. Diagram of “Stigmaria ficoides” from “Elements of Geology: The Student’s Series” by Charles Lyell (1871). 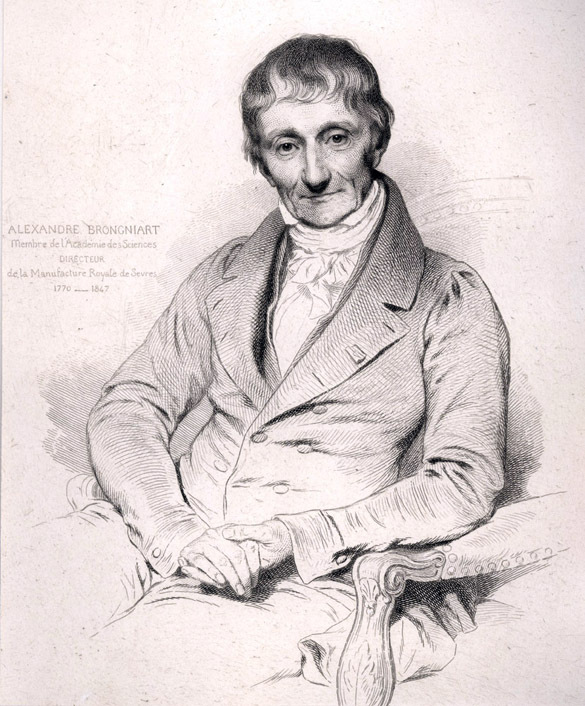 Brongniart is best known to me as one of the first biostratigraphers. He worked out the first divisions of the Tertiary Period (now known as the Paleogene and Neogene Periods) using fossils to mark time intervals. He also was the first to systematically study the trilobites at the other end of the geologic time scale. Brongniart did original geological mapping with the famous Georges Cuvier in the Paris region as well. He was a professor at the École de Mines and director of the Sèvres porcelain factories. I think he looks rather friendly in a Frenchy way. Brongniart, A. 1822. Sur la classification et la distribution des végétaux fossiles en général, et sur ceux des terrains de sédiment supérieur en particulier. Soc. Philom., Bull., pp. 25-28 and Mémoires Du Muséum d’Histoire Naturelle 8: 203–240, 297–348. Frankenberg, J.M. and Eggert, D.A. 1969. Petrified Stigmaria from North America: Part I. Stigmaria ficoides, the underground portions of Lepidodendraceae. Palaeontographica 128B: 1–47. Jennings, J.R. 1977. Stigmarian petrifications from the Pennsylvanian of Colorado. American Journal of Botany 64: 974-980. Rothwell, G.W. 1984. The apex of Stigmaria (Lycopsida), rooting organ of Lepidodendrales. American Journal of Botany 71: 1031-1034.